Guests demand for higher performance Wi-Fi is never ending for hoteliers. The Wi-Fi refresh cycle always comes sooner than expected and can never happen fast enough for guests. So why does this happen and what can be done to get ahead of the curve and enjoy a longer investment cycle? While it is true that not everyone has a smartphone or tablet, it seems every hotel guest has two or three mobile devices and when you consider families, the number of mobile devices per room and their bandwidth requirements tends to be pretty significant. Research of mobile data trends from the Cisco VNI report claims that mobile data traffic grew 5 fold over the last 5 years and 60% of this traffic is offloaded onto fixed networks like Wi-Fi. It is expected that mobile data traffic will grow at a compound annual growth rate (CAGR) of 47 percent from 2016 to 2021. And while video represents 60% of the traffic today, they expect 75% will be video by 2021. In light of these growth rates, it is not surprising that hoteliers have had a difficult time getting ahead of the tsunami of demanding guests and their data consuming applications. Many hotel deployments use one ceiling mount AP (above the ceiling) in the hallway to cover four or more guest rooms. 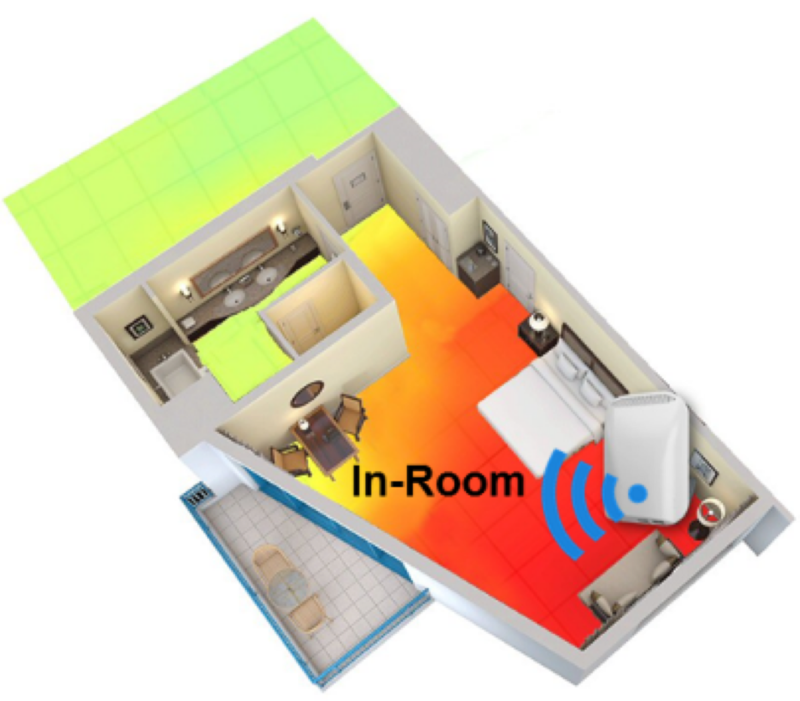 From an RF (Radio Frequency) perspective, the RF has to penetrate from the hall, through the bathroom (tile, mirror, plumbing, walls) before getting to the guest area. All these walls and barriers attenuates the signal and impacts the Wi-Fi performance considerably for the guest. The proximity of the device to the AP is critical to achieve expected data rates of the technology. 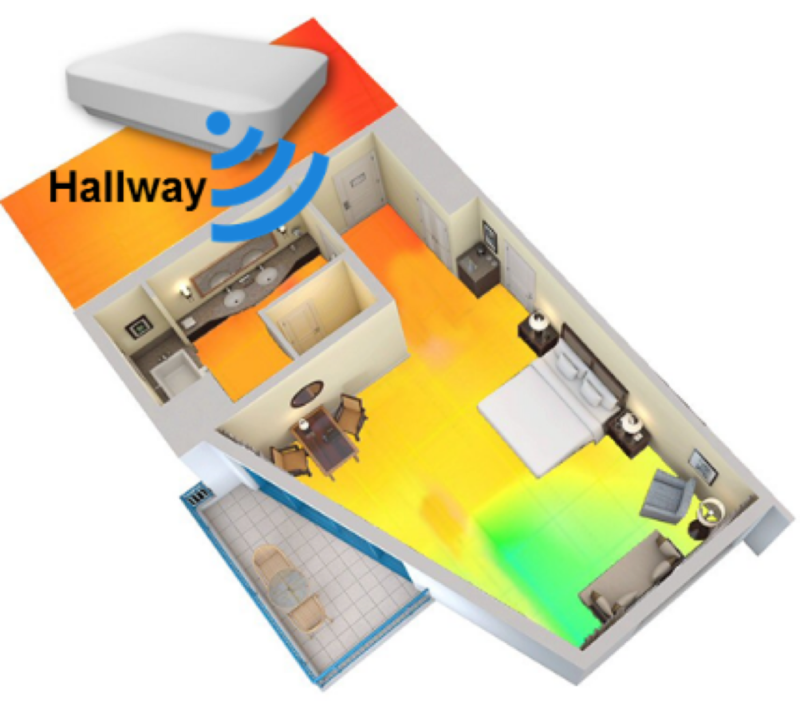 Consider also that a single hallway AP would be shared across four or more rooms, each with a different number of guests, devices, device types and applications. Though it all works, each guest experience will vary. To break the upgrade cycle and truly improve the guest Wi-Fi, hoteliers can create an ‘At Home’ experience by using a wall plate access point in each guest room. This strategy delivers the RF signal where the guests use their mobile devices; near the desks, sofa and beds. This is where the guests are watching over the top services from Netflix, Amazon, YouTube, and Hulu, or video conferencing with business or family. The ‘At Home’ experience creates a similar environment, guests experience in their living rooms, with strong Wi-Fi signals and close proximity to the AP radios for the greatest data rates. This strategy also provides guests with a dedicated AP and its bandwidth for the best guest experience, however, the APs load share between rooms, providing redundancy and reserve capacity if needed. Back in the day, hotels started with one AP in 8-10 rooms, then upgraded to one AP in 6 as demands increased, to now one AP for 4, only to continue receiving guests’ complaints while incurring a faster investment cycle leading to upgrade fatigue. It is time to break this cycle. The combination of the latest 802.11ac technology and the ‘At Home’ guest room strategy puts you ahead of the competition. It eliminates performance and connection complaints from guests delivering the best experience possible, and provides the hotelier a longer investment cycle well into the future. To learn how you can stop Wi-Fi complaints and create the best ‘At Home’ experience for your guests, stop by the Extreme Networks booth (#2315) at HITEC to see check out the industry’s broadest choice of wall plate access points, including the new AP 7612 with Multi User MIMO technology and deliver the ultimate guest experience! This post was originally published by Product Marketing Manager Cal Calamari.